Our professional staff is always happy to answer all questions. Or Request A Price Quote Here On Embroidered, Customized Hats & Caps, Custom Printed T Shirts, Customized Shirts, Sportswear, Jackets, Hoodies, Towels, Aprons Or Bags. Please note: Our facilities are networked nationwide. We ship from twelve states across the U.S., to save time and shipping costs, and we also specialize in RUSH ORDERS. * BTW, We don’t offer automated price quotes on our website, because unlike other companies, we don’t offer the same customized t shirts / customized shirts service to everyone in the same way. We treat our clients as individuals. We only do high quality work, not cookie-cutter, run of the mill work that looks like everyone else, because we want our clients work to stand out, and get noticed! Please take a look around our site and see how we are different. A perfectionist’s attention to detail, state-of-the-art equipment, and premium quality materials are the hallmarks of our high quality silk screen printing, heat transfer and embroidery departments, since 1995. All phases of layout and design available, and all our custom printed t shirts, customized hats & caps, customized shirts and other silk screened, direct to garment or heat transfer printed garments can be completed in as fast as 24 hours! Need special types of printing? FX? Glitter? Metallic Ink? Glow In The Dark? Distressed Printing? Discharge/Suede/Puff Inks? We can do it. Just ask! * If providing completed design for custom printed t shirts, customized hats & caps, customized Shirts, jackets, towels, hoodies, sweatshirts, aprons, etc., please make sure to give us high resolution digital files in photoshop or illustrator at actual size that they are to be printed, in separate layers. We accept, PSD, PDF, JPEG, BMP, GIF, EPS, AI, TIF files. Please convert type to paths or outlines, or send us the font used with the artwork. How many silkscreen colors can Nova print? 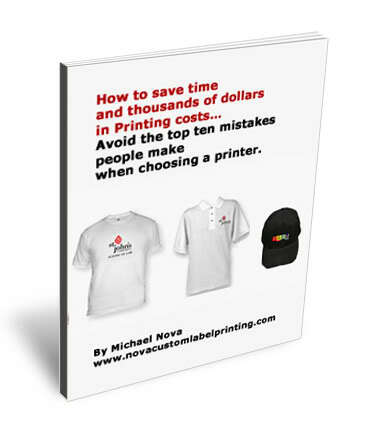 When printing with basic silkscreening, generally six spot colors, or on a dark colored garment, five colors plus white. Otherwise, CMYK full color printing would be used for an unlimited amount of colors. CMYK quality is best printed on light colored shirts. Dye-sublimation printing is a printing process using heat to transfer dye on to garments. Transferred by a computer printer, this process can produce photographic like images with continuous tones. Best used on synthetic fabrics like polyester. Popular for custom printed t shirts and customized shirts, this process is also sometimes referred to as extract printing. This type of printing is used on natural fabrics (100% cotton), removing the dyes of the fabric through a color removing agent, like chlorine or hydrosulfite, bleaching a dark colored garment, and creating a light colored area on it. This area is then printed on. Especially good for printing full color process CMYK on dark cotton fabrics, resulting in a vivid, bright printed image. This process also results in a softer garment because of the dye being removed. What’s Direct to Garment Printing? Direct to garment printing (or DTG as it’s sometimes known as) is basically high quality inkjet printing. It yields photorealistic quality and has a feel to the touch that is softer then heat transfer printing. If reproducing a photo on a garment, it’s the best bet. What is the minimum for orders? We have a 72 piece minimum, but can occasionally accommodate smaller orders. Please contact us for details. What other products are offered? I am out of state. Is it possible to help me? Yes, we have facilities across the U.S. to help save time and costs on shipping! Nova has more than a dozen facility locations, so our clients can save on all Custom Printed T Shirts, Customized Hats, And Customized Shirts.. Please give me more details on screen printing. Please check our screen printed t shirts page which lists many more FAQ’s.